Text If you control a monster that is not a "Burning Abyss" monster, destroy this card. You can only use 1 of these effects of "Scarm, Malebranche of the Burning Abyss" per turn, and only once that turn. 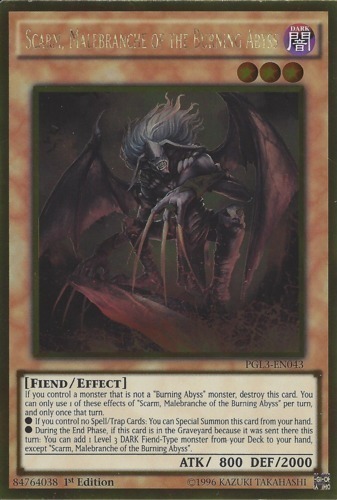 ● During the End Phase, if this card is in the Graveyard because it was sent there this turn: You can add 1 Level 3 DARK Fiend-Type monster from your Deck to your hand, except "Scarm, Malebranche of the Burning Abyss".